The daily securities turnover on the Baku Stock Exchange (BSE) on February 6 was 257,75 million manats, as evident from the statistics published on the exchange website. Most of the transactions consisted of placing notes of the Central Bank of Azerbaijan (CBA) worth 248.6 million manats. Transactions were concluded at a price of 99.4388 manats per note. Repurchase transactions with bonds of the national Ministry of Finance at 9.04 million manats were also concluded. A total of 97,100 transactions were concluded on these transactions. Transactions on bonds in the secondary market made up 105.4 thousand manats. During the day, transactions were concluded on bonds of the Ministry of Finance (52.7 thousand manats) and bonds of BOKT Embafinans LLC (52.6 thousand manats). 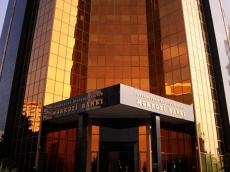 Transactions on bonds of the Ministry of Finance were concluded at a price of 107.4142 manats per bond, and 1012.4587 manats per bond on those of BOKT Embafinans LLC. The volume of transactions on the secondary market of shares of the stock exchange stood at 3,500 manats. During the day, transactions were concluded on the shares of Tekhuniversal OJSC ("Texuniversal" ASC) and Glassware JSC ("Saxs? qablar" ASC).